yoshi has her sword and her mask as an option-- so theres a reminder of her there and thats good enough maybe. lohn : yoshi has her sword and her mask as an option-- so theres a reminder of her there and thats good enough maybe. Well, we'll just have to wait and see what happens in the future. This petition might remind Namco that the character still does have fans out there who are getting tired of them beating around the bush. I swear, they make a full-blown upgrade to bring back someone like Armor King yet they go to any possible lengths as to not revive Kunimitsu. 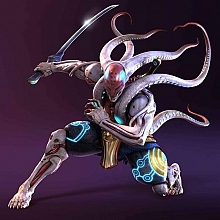 Slapping a kitsune mask on Yoshimitsu and giving him a knife he can't even use will not get the job done.